Rohan says:"Lightweight, compressible and warm, our Microgrid Stowaway Jacket is an incredibly efficient, lightweight fleece that packs away into its own Packpocket™ for convenient stowage." 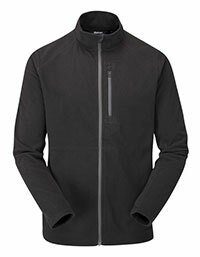 The Microgrid Stowaway Jacket from Rohan is a lightweight fleece with a full length zip down the front. Manufactured from hardwearing polyester in a grid structure, it has a 'ribbed' look and feel. This grid structure contains lots of air pockets - and it these air pockets that, in theory, offer high levels of insulation whilst keeping the weight to a minimum. At first sight and feel I thought this fleece was too thin and unsubstantial to work properly - but after a few minutes on the fell I soon changed my mind. It is lovely and warm and works really well as a mid-layer under a soft shell or water proof jacket. And because this fleece is 'full of holes' it is extremely breathable too. The front zip is also lightweight and zipped up right up under my chin where this is a small fabric zip guard to keep the zip puller secure and nicely tidied away. It only zips up one-way - from the bottom up. There are two zipped side pockets big enough to take a folded OS map. There is also a slightly smaller, zipped breast pocket plenty big enough for your mobile phone, keys, compass or GPS device. The full length sleeves have thumb holes on the cuffs to stop any cool air getting up your sleeves and serve to keep the sleeves in place when putting on or taking off an outer layer. The chest pocket also doubles as a stow pocket for the fleece to keep it all neat and tidy in a package about 20cm (8") in diameter x 10cm (4") thick. When put on the scales it came in at 393g (13.9oz) which is a little more than the stated 320g but still really light for a fleece. Incidentally, the zip puller on the inside of the chest pocket is the only one with a toggle attached to it - which was useful for opening and closing the chest pocket zip when the fleece was stored in it. There is a short video demonstrating many of the features mentioned above of the pullover version of this fleece on YouTube which you might want to look at. You can access it here The Rohan Microgrid Stowaway Zip - Product Demonstration. Don't let the thinness of this fleece fool you - this is a really good bit of kit. Whether worn as an outer layer or as a mid layer under a waterproof shell, its warmth to weight ratio is terrific and The Microgrid Stowaway Jacket from Rohan really does the job.